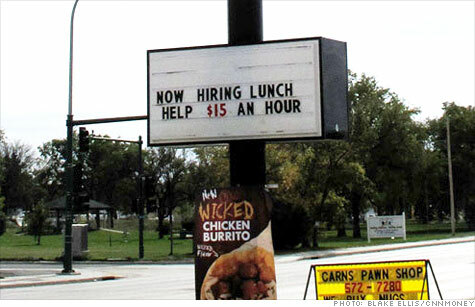 In the tiny towns surrounding the oil-rich Bakken formation in North Dakota, restaurant workers can make $15 an hour. New technologies for tapping oil in North Dakota's Bakken formation have transformed nearby towns like Watford City and Williston into boomtowns. While the pay can be excellent for the job seekers moving there, finding a place to live may be next to impossible. CNN.com readers thought it was still a good deal, although some mentioned the weather, and others mentioned environmental concerns. zooni said, "This is not a story, as many people move for jobs and live in cars. With a 6-figure salary you can buy a luxury camper if there are no rooms." pianobarb said, "What about trailers? And if they have an extra bedroom, people in North Dakota could start renting out rooms: win-win for everyone. So what if they have to rough it for awhile? They're going to be making beaucoup bucks." andTimmy replied, "Come out here and try it. ... Everything is taken up west of the Missouri." IgM2 said, "How about all of the out-of-work contractors and construction teams go up there and build houses? More work for everyone!" Nick11354 said, "If it were that easy to secure a job and housing (without current employment) more would be doing it." mouthbreathr replied, "I live in one of these small towns in North Dakota, and yes, it is that easy. Oil brings a huge need for service-related industries. The biggest challenge is housing: can't build them fast enough. If people want a job, come to North Dakota. The salaries quoted are real. Downside: it is cold, but manageable." MickProPer said, "All of these folks who are journeying there to cash in on this oil boom, may change their minds, after they've lived through a North Dakota winter - a 45 mph wind and -40 degrees makes for about -100 degree wind chill!" Athenais Padgett said, "I'm so sick of people bitching about 'how cold North Dakota gets.' Ya, it get's cold. -30*F in January/February isn't uncommon. But as long as you know how to wear a coat, gloves, scarf, and boots, you'll be fine. I don't think people realize that North Dakota isn't any farther north than Maine is. And our summers are wonderful: no humidity or bugs." RedDawn2012 said, "How cold is it in North Dakota? I spent January 1972 on a programming job in Grand Forks, ND, and it was a sunny afternoon when I arrived. I was last off the plane and jumped back inside after taking a breath and said to the stewardess, 'What the hell is wrong with the air?' She said, 'Didn't you hear my announcement that it is 35 below zero outside?' "
Not everyone thought the oil boom was a good thing. When Philo1971 wrote, "This is what America is about. Real Americans do what it takes to make it through tough times. Stories like this make you hate OWS even more. While these people are picking up and moving to the middle of nowhere to support their families the bums at OWS just sit around and whine." JomoDaMusicM said, "Tough times, lol, ON TEN GRAND A MONTH." and Tex71 asked, "Should Americans HAVE to pick up and move their families out into the middle of nowhere just so they can make ends meet? Is this the best that the wealthiest nation in history has to offer its hard-working citizens? If that is really what you are saying then shame on you." latuya83 wrote, "This is why we need to allow drilling in this country, there is plenty of oil and gas resources. I'm all for the environment, but we need to keep things in perspective and right now is not the time to go green. We need to stimulate the economy and create jobs first. Once the country is back on track then we can start worrying about green jobs and all the tree huggers." denvmike replied, "I agree, but first you move to one of the towns where fracking has fouled the local water supply." I am honored that Sheryl would place me in such esteemed company. I truly hope she got her Bengal cubbies home all right. Damn bobcat its so expensive here in DC area with all overpaid IT yuppies moving here from all over $15 hr is like minnimun wage. It used to not be that way. But thank the overpaid yuppies ,they have runied the quality of life here, due to the high cost of living. Should I support the protesters? I am a homeowner. I came to own my home by claiming that I was permanantly disabled while in the Army working as a supply clerk. I have been recieving 2,800 dollars per month plus free meds for years, and run a small cash-based business on the side where I do work that is very hard manual labor. I have the business under one of my girlfriends names to avoid being found-out. Should I a.) Support the protesters on this blog, or. b.) Put them down and call them name? Yeah, I know. Down my way, the wages remain depressed, but I guess in an attempt to to keep up with the rest of the country, they keep the status quo of raising the prices on the goods and services. Hell, we're getting priced out of life. Ask your local newspaper/media why do they keep silent about crime/genocide !!? Ask them why do they KNOWINGLY participate in crime/genocide !!! BECAUSE SILENCE = CRIME !!! WALL STREET PROTESTS...NOT ANTI WALL-STREET AT ALL, BUT INSTEAD RACIALLY MOTIVATED VIOLENCE AGAINST WHITES !!! THEY WERE MURDERING YOU WITH AND INSIDE OF THEIR CORPORATIONS FOR OVER 66 YEARS !!! THEY HAVE CLOSED DOWN ALMOST EVERY SMALL COMPANY(FARMS) IN UNITES STATES OF AMERICA AND NOW, THEY WANT YOU TO GO OUT THERE AND PROTEST FOR THEM AGAINST WALL STREET(because corporations = Wall-street) !!! THEY WERE CRIME CONTEMPLATING AGAINST US PER EQUAL EMPLOYMENT OPPORTUNITY COMMISSION FOR OVER 66 YEARS AND NOW, THEY WANT YOU TO RAISE COMMUNIST FLAG UNDER AMERICAN SKY !!! ONE RACE; RAT RACE(Wall street protesters are Obama's raise of the planet Apes army which spread from London per Zionist Washington DC and communist Moscow where new Stalin is in place – PUTIN) !!! IF YOU PROTEST(YOU SHOULD), MAKE SURE TO RAISE SIGN WHERE DISPLAYED I CITE "66 YEARS OF GENOCIDE AGAINST WHITES IS NO LONGER ACCEPTABLE" OR GET LOST HOME IF NOT ALREADY HOMELESS(I despise people who starve to death out there and are afrraid to say out loud what is truth...I despise people who only see themselfs and do NOT care even about children of their own...chidren who will be turned one day in white refugees as seen on above video) !!! CREATE AWARENESS AND POST THIS VERY SAME VIDEO ON﻿ YOUR YOUTUBE CHANNEL. HOW DO YOU KNOW WHAT TRUTH IS !!? WHATEVER YOU WERE BORN IS WHAT YOU ARE(truth therefore) AND FOR WHATEVER REASONS YOU HAVE CHANGED(distorted yourself) SINCE 9/11 IS WHAT YOU ARE NOT !!! IS IT INDEPENDENCE THAT WE CELEBRATE OR DEPENDENCE (what are your credit card bills or alimony saying about it) !!? HOW IS YOUR DIABETES AND LOST MARRIAGES !!? FORECLOSURES AND JOB SEARCH !!? THAT IS THE QUESTION TO BE OR NOT TO BE !!! IS IT LAND OF THE FREE OR STATE OF TERROR AGAINST OWN WHITE POPULATION !!? IT IS TIME TO LET THEM KNOW WHAT COLOR ARE THE STRIPES ON OUR STAR SPANGLED BANNER !!! TIME TO DETERMINE WHOSE INDEPENDENCE/AMERICA, WE CELEBRATE TODAY(who wants to erase us and denies us the right to exist) !!! IT IS IMPORTANT TO KNOW WHOM WE ADDRESS WITH "PRESIDENT" (STOP HUMILIATING YOURSELF) !!! YES , WE CAN..YES , WE CAN..WE WILL WIN IN WAR ON TERROR (30 whities or what are terrorists will never come back alive due to Afghanistan helicopter crash...thank you lord..aamen). OS(B)AMA IS MOVING OUT OF AFGHAN FEW DAYS AFTER MY POSTING ONLINE(out of Iraq few months before elections) AND IS WILLING TO IMPROVE ECONOMY(genocide against whites) FEW MONTHS AHEAD OF ELECTIONS(what is the difference between temporary and permanent jobs in USA!!?) !! ALL THESE JUST SO YOU CAN CLICK AGAIN ON ELECTRONIC VOTING MACHINES WHICH CAN BE ALL CONTROLLED(AND ARE CONTROLLED OR COMPUTER OPERATED) FROM A SINGLE CELLULAR PHONE(for entire USA)...JUST SO YOU CAN CHOSE AGAIN BETWEEN WHATEVER WAS ALREADY CHOSEN FOR YOU TO CHOOSE FROM BY ZIONIST/JEWISH LOBBY IN WASHINGTON DC. Don't worry O(s)bama, you have just saved lots of Dollars in your DEBT DEALS(DEAD & ILL) as those America best (Navy Seals) would also grew older and then you already know how it goes !!! WAKE-UP !!! WAKE UP PEOPLE BEFORE IT GETS ALL TO LATE ON PLANET APE !!! TEARS WON'T DO YOU ANY GOOD !!! AS BUSH STATED "THAT'S WHAT THEY ARE PAID FOR"(to die ) !! STOP THE GOVERNMENT TERRORISM AND TERROR AGAINST WHITES WORLDWIDE IN THE NAME OF MULTYCULTURALISM OR NWO !! WHITES AREN’T WELCOME IN AMERICA ANY LONGER !!! OUT OF AMERICA WITH WHITES NOW !!! IF YOU PROTEST(YOU SHOULD), MAKE SURE TO RAISE SIGN WHERE DISPLAYED I CITE "66 YEARS OF GENOCIDE AGAINST WHITES IS NO LONGER ACCEPTABLE" OR GET LOST HOME IF NOT ALREADY HOMELESS(I despise people who starve to death out there and are afraid to say out loud what is truth...I despise people who only see themselves and do NOT care even about children of their own...children who will be turned one day in white refugees as seen on above video) !!! "Fully 43% of African-American's sole source of income is welfare."-Mr. Precious, president of the National Association for the Advancement of Colored Peoples, aka the NAACP. You should be protestin welfare fraud or the raypeing of Africa by US corporations. Your brothers and sisters are starved to death as American's, even many African-Americans living off of welfare are obese. Attractive blog for CNN from here you will find the latest news and information from CNN’s correspondents and sources around the world. We’ll cover fresh stories big and small – stories that are breaking, developing or otherwise driving the collective daily conversation, along with some items we find interesting and worth sharing. Thanks for the nice blog. I was very happy to uncover this web site. I wanted to thank you for your time just for this fantastic read!! I definitely liked every bit of it and I have you book-marked to look at new stuff in your blog. Ummmm.... North Dakota DOES get humid and DOES get bad mosquitos... seriousely anyone who says otherwise is not that bright... I live in North Dakota with my husband and our son. The winters are cold but arent winters supposed to be cold? also im going to point out that housing is NEAR impossible.